Rapid Optimizer deploys a rule based AI algorithm in rewriting ABAP programs with better efficiency while retaining functionality. It is a perfect example for “Assisted Intelligence” where machine intelligence together with human intelligence solve a real world problem much faster than either one alone. 80% of performance issues are caused by custom ABAP. An inefficient ABAP program not only runs longer, but also consumes more system resources, causing problems to other programs. Other resource-hog programs may themselves have acceptable run times & remain unnoticed as a potential candidate for tuning. 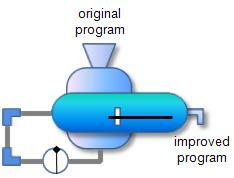 What is needed is not just a way to improve one program, but mass improve several custom programs. Rapid Optimizer does exactly the same.